The capacity of man to feel emotions, to tell of past experiences or to visually represent a scene, has always been expressed through two privileged art forms: theatre and music. If the first is associated with eyes and vision and the second to hearing we immediately understand, looking at the ontogenetic development of the human being, that sound has an even more ancient presence in the history of an individual’s neural connections. In fact, today we know with absolute scientific certainty that a fetus even before birth has the ability to hear voices, sounds and noises. Perhaps this is the reason why today music is used not only as a form of entertainment, but also as a therapeutic tool. The Armenian philosopher Georges Ivanovitch Gurdjieff (1866-1949) knew this very well when he said: “All objective music is based on inner octaves. It can give precise results, not only of a psychological nature, but of a physical nature. (…) The music that destroyed the walls of Jericho is a legend which clearly portrays objective music. Ordinary music, of any kind, could never make walls collapse, but instead objective music can do just that. And not only can it destroy, but it can also build up”. A psychologist knows which are the “walls of Jericho” to which this sentence refers; Beyond any fascination that the miraculous or magical can provoke, there exists psychic walls, stereotypes or cultural conditioning which are imposed in our soul as true limits to reasoning, perception, and often even memory. There exist walls that only music can shatter. And there is music, like the patriotic or Nazi-fascist, that can erect walls of identity that imprison men in dreams of omnipotence. The present CD contains a collection of pieces written by two extraordinary artists (Gurdjieff and De Hartmann) who had a single objective: to help man awaken from the long sleep in which he lies. This concept is completely dichotomous to the claim of modern man to be the most “awake” individual of all, scientifically more capable and rationally more able. The music we will listen to in this collection is the artistic result of a philosophical thought which invites all of us to a new awakening, to a new and important revolution. Awakening and revolution that have nothing to do with the creation of new political movements or systematic factional struggles, rather of an individual experimental catharsis in which we begin to observe ourselves. The awakening that Gurdjieff talks to us about begins with the closing of one’s eyes. It starts by directing attention inward, moving in a direction which is the exact opposite of the invitation sent to us by contemporary culture: while TV explains how we cannot be happy without the latest car model, the Armenian master reminds us that we cannot be happy without ourselves. “Remember yourself!” he constantly affirmed to his students, who have often misunderstood this warning as a simple breathing technique of “being in the world”. Self-remembering is the most important concept of Gurdjieff’s philosophy, but it is not the simple directing of attention to one’s own body. Remembering oneself is an invitation to remember that you are more important than the emotions you feel, more important than the objects you own, more important than the objectives you propose. Do not be fooled, do not be seduced by the first vendor who passes by your door wanting to sell you the elixir of happiness at a modest price. First and foremost, you need to know yourself, you need to converse with your soul and understand the true reasons of the impulses which you cannot control. Jung, Sigmund Freud’s most important student, stated: “Make the unconscious, conscious, otherwise the unconscious will guide your life and you will call it destiny”. Gurdjieff would have been in complete accordance with this: the most important task to which we are called is the ability to distinguish what really matters from what is secondary. And, in this, we modern men and women, children of the digital age still have a lot to learn. To this day we believe that profit is our most important asset, even more so than the planet in which we live and which we are slowly destroying because of our greed and our “sleep”. Our children and our children’s children will have a clear example, historically well-circumscribed, of what that sleep of consciousness is, of which Gurdjieff talked so much about throughout his life. However, on the other hand, he was well aware that such an awakening could not be a phenomenon for the masses. Awakening always happens in the heart of individuals, in the silence of one’s intimacy. The music of this collection wants to try and accompany the catharsis that can occur when, alone, or with friends, we try to listen to the voice of the silence that dwells within us. The music of Gurdjieff and De Hartmann is not intended to delight the listener with the purpose of distracting him from himself. Rather it wants to lead him to the discovery of that abyss which lives in the depth of his heart and of which, he is often afraid of encountering. Gurdjieff and De Hartmann created about 223 compositions which were never published during Gurdjieff’s lifetime. Only after 1979 with the presentation of the film by Peter Brook “Meetings with Remarkable Men” and, later, with the publication by Keith Jarrett of his “G.I. Gurdjieff Sacred Hymns”, their music began to arouse a strong public calling. In Italy, thanks to Franco Battiato’s interest in Gurdjieff’s teaching and music, Italians have had the opportunity to indirectly enter into contact with concepts such as “Centro di Gravità Permanente” (The Permanent Center of Gravity), the “Voce del Padrone” (The Master’s Voice) (the single and central “I” that commands all the others) along with many other references to his philosophy that are duly hidden in the words of his songs. From that moment on, numerous musicians have tried to re-propose the works of De Hartmann and Gurdjieff on the piano, especially during the last few years. 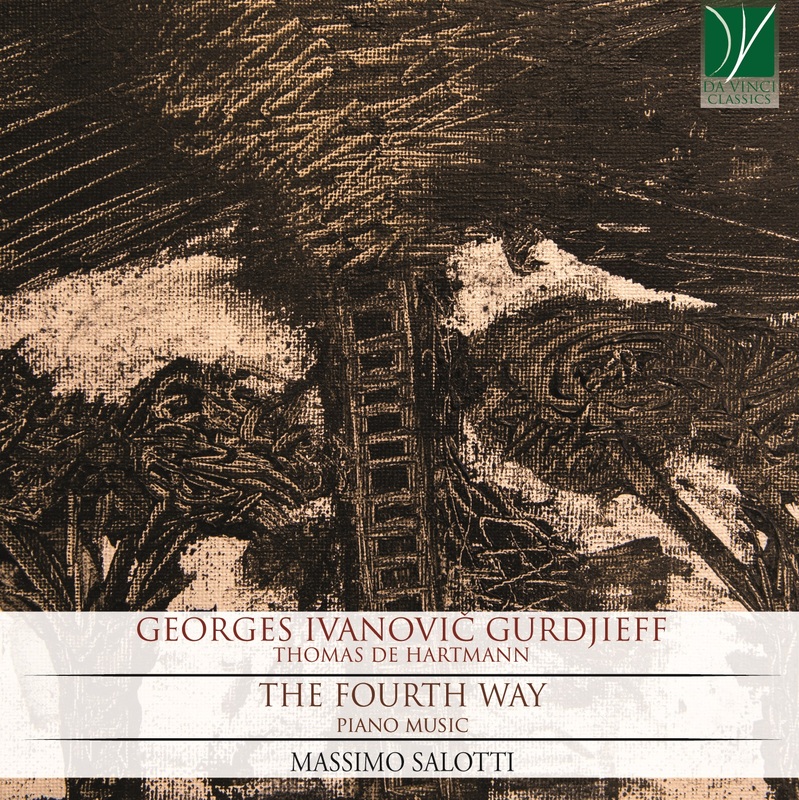 I must, however, be honest in saying that not everyone has been able to convey what Massimo Salotti has given me by listening to the music of my beloved Gurdjieff on his piano. Back in 2003 I had the honor of directing the performance “Gli Alunni di Monsieur Gurdjieff”, a theatrical piece which I wrote as a tribute to the figure of the Armenian master and which received notable public success (enjoyable still today on YouTube). The performance proposed some monologues of my creation, interspersed with listening to some pieces by the master. It would have been wonderful, on that occasion to have had Salotti near and to have worked with him. His musical notes dignify the work of the Armenian master and give back to us all the ancient perceptions of his teaching. Massimo Salotti is a pianist, composer, painter and digital performer. He obtained his Master in Music very young at the Istituto Musicale “L. Boccherini”, in Lucca, under the guidance of M°. Riccardo Pieri. He then specialized with M° G. Sacchetti, M° P. Rigacci and M° Pier Narciso Masi. In 1997 Massimo Salotti had already won many first prizes in solo competitions and started his artistic career. He performed for important concert associations such as: the Fondazione Walton, the Associazione Musicale Lucchese, the Festival da Bach a Bartok, the Amici della Musica, the Goethe Institut and the Festival delle Nazioni. He also performed for important theatres like the Comunale of Bologna, the Sala Sinopoli of Rome, the Teatro Ponchielli di Cremona, the Teatro Regio di Torino, the Teatro dei Rozzi of Siena and the Teatro Regio of Parma. In 1998 Massimo Salotti founded the Alban Berg Duo, a chamber ensemble that won many international first prizes, and the prestigious Master in Chamber Music at the Accademia di Alto Perfezionamento of Imola. In 1999 Massimo Salotti had important collaborations with theatres that highlight his abilities as a vocal coach and opera répétiteur, making him work with great artists such as Andrea Bocelli, Katia Ricciarelli, Roberto Servile, Herbert Hands, Maria Billeri, Gabriele Viviani, Massimo Cavalletti, Isa Danieli and Mariano Riva. He was also the person in charge of the UNESCO C.I.D.M. projects in 2006 and 2011. Massimo Salotti is a poliedric artist. He further developed his studies in composition and digital-photo art, bringing his “musical visions” in Brazil (Sao Paulo, Brasilia, Curitiba, Belo Horizonte), England (London), Switzerland (Zurich, Uster, Dietikon), Azerbaijan (Baku) and Belgium (Bruxelles). In 2013 Massimo Salotti was invited by the Italian Embassy to hold a Master class on Italian Opera at the prestigious Teatro Sao Pedro of Sao Paolo. In 2014 Salotti had a leading role in the construction installation of “XXIV Waves for Piano Solo” dedicated to the american artist David Lynch at the Xth Festival Internazionale on cinema “Lucca Film Festival”. David Lynch himself attended the event and was particularly impressed and enthusiastic about it. In 2016 Massimo Salotti was finalist at the Premio Internazionale di Arte Contemporanea Premio Lynx. Massimo Salotti is the Director of the Scuola di Musica Sinfonia in Lucca.